In this film the people of a delta community are in a fight against a large and powerful oil company who has done little to give back to the poor area it derives much of its resources from and ruined much of their land. The people in this community fight against the oil companies for their right to their land with a cast of famous American actors including Vivica A. Fox and Mickey Rourke. Obenson, Tambay A. 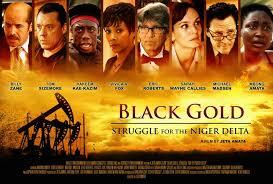 "Nigerian Filmmaker Jeta Amata Reshooting 'Black Gold' Under New Title; Adds More Hollywood Names To Cast." Shadow and Act: On Cinema of the African Diaspora. IndieWire, 1 Feb. 2012. Web. 18 Nov. 2013. NBF News. Nigerian Latest News Papers News Online, 16 Feb. 2011. Web. 18 Nov. 2013. Suzanne DeLaurentiis productions; black gold inks deal with DeLaurentiis productions for film about the tragedy and injustice that plagues the niger delta. (2011). Entertainment Business Newsweekly, , 38.